A day after the assassination of Daphne Caruana Galizia six months ago, Times of Malta titled its editorial “the day the music died.” This evoked Don McLean’s song about the death in a plane crash of rock and roll musicians Buddy Holly, Ritchie Valens, J.P. 'The Big Bopper' Richardson and their pilot Roger Peterson. The following Sunday I titled my commentary in the Sunday Times of Malta: The music must not die. “The way forward is, therefore, the transformation of anger into a positive force. Journalists need to find new strength to continue the investigative work of Daphne Caruana Galizia. What she can do no longer, we journalists must do with more passion and intensity. Non-journalists have the duty to keep on being reliable and truthful sources. There are undoubtedly many scandals that only a tandem of courageous citizens and good journalists can unearth. "The journalist's blood should be the seed of more investigative journalists and more sources. Only this will guarantee that the music does not stop." I am happy to note today that the music did not stop. It could have been louder, and was louder for the first couple of months after the assassination. True. But stop it did not. A small number of committed people have kept the flame burning. Moreover it has just been announced that a group of 45 journalists from 18 international news organisations, including Times of Malta, have united in a unique collaboration to continue Daphne's most important stories. The journalists have for the past five months pored over 750,000 files and official documents to complete Ms Caruana Galizia's work on corruption and international money laundering networks. The result of their work will be made public as of tomorrow. 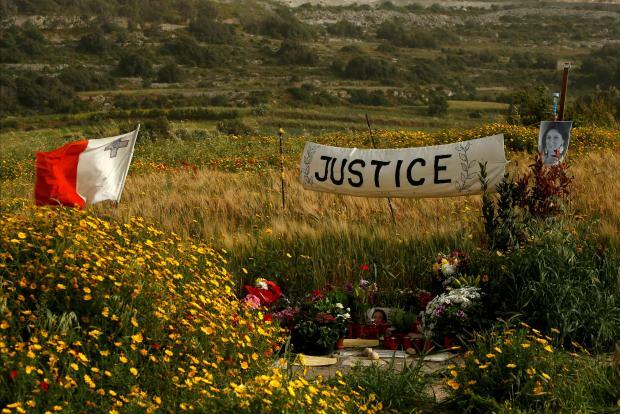 Three men are being accused of murdering Daphne Caruana Galizia, but the real murderer, that is, the person or persons who commissioned the crime, are still on the run. Rumours abound but no such arrests have been made. “Is the state an accomplice or is it just incompetent? We cannot think of national unity without first answering a very important question and working through the answer. “I believe it is incompetence not active complicity; but I also believe it is incompetence of the culpable type. “The Prime Minister condemned what had happened in the strongest possible terms. I am certain that he meant what he said. I have no doubt that he is shocked and that he would really like the police to leave no stone unturned to bring the perpetrators to justice. Today our government continues to spend our money on advertising campaigns trying to deviate the people's attention. It is continually unleashing its army of trolls on the Internet to savage anyone who dares not agree or who criticises it. The campaign to delegitimise anyone not in the good books of the powers that be goes on unabated. This is not the time for facile and stereotypical calls for national unity. This is the time to face the demon that has been unjustifiably forced upon us and to throw it back to the nethermost part of hell where it belongs. The music must continue playing louder and louder.